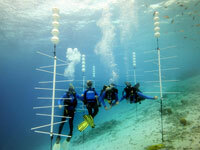 Coral Restoration foundation Bonaire Installs New Coral Nursery | Dive Industry Association, Inc.
Bonaire, Dutch Caribbean (January 5, 2015): The Coral Restoration Foundation (CRF) Bonaire is proud to announce that on December 10th a new coral nursery has been installed on the island. In total five new coral trees, all sponsored by the Tourism Corporation Bonaire and WWF, have been placed at shallow depths in front of the Harbour Village Resort. The placing of the new coral trees was a unique cooperation by the CRF Bonaire and CRF USA, with the help of the Bonaire Marine Park Manager Ramon de Leon and Great Adventures Bonaire staff. The new nursery will be maintained by Great Adventures Bonaire, officially a new CRF Bonaire Dive shop member, with a capacity of producing approximately 500 Staghorn and Elkhorn corals on a yearly basis. The newly harvested corals from this nursery will be transplanted to the degraded parts of the reef on Bonaire. The CRF Bonaire project started as an idea by Buddy Dive Resort Bonaire and the Coral Restoration Foundation USA to achieve the main and most important objective: preserve and restore the reefs on Bonaire. Today the CRF Bonaire has transplanted 3000 corals to five different restoration sites on the Island with a total nursery capacity of more than 7000 corals. This entry was posted in Environment, Press Release, Travel Destinations. Bookmark the permalink.